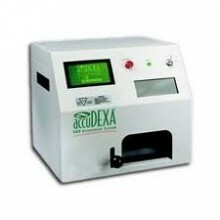 Operating the AccuDexa is just as easy. After placing the patient's hand in the unit, just follow a simple set of commands in the view screen. In 30 seconds you have the results you need. It's as simple as taking their blood pressure! AccuDexa assesses the phalanx of the middle finger. This BMD value is a relative indicator of bone density elsewhere in the body. AccuDexa BMD estimates can also be used as an aid to the physician in determining fracture risk. Additionally, phalangeal density tests have shown in studies with Radiographic Absorptiometry to be more predictive than both forearm and spine BMD tests in predicting vertebral deformity. Click the button below to add the Schick AccuDEXA BMD Portable Bone Densitometer to your wish list.